Late season Kansas goose hunting. Goose hunting reservations refers to field set goose hunts covering the regular, late and spring goose seasons. Goose hunting reservations are different than those for duck hunting. See duck hunting reservations. Recognizing that the goose hunting advantage of Mid-America Hunting Association covers tens of thousands of acres of land in Missouri, Iowa and Kansas leaves a lot of ground to cover. Narrowing down where to hunt through checking migration reports should get the hunter to pick one state. Knowledge of that state’s waterfowl refuges and river systems further narrows down where to hunt leaving it the surround counties. At that point is when the Association map library is employed. 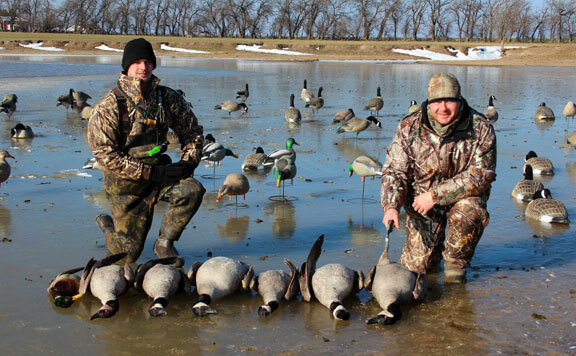 See Kansas goose hunting or Missouri goose hunting for ideas of where to scout for geese. 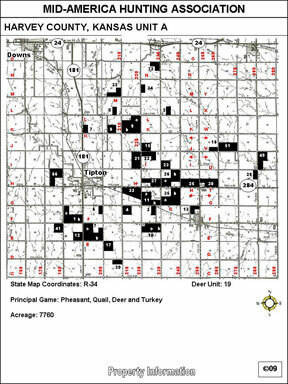 There are approximately 200 such maps on the Association hunter’s online map library. All the land available for goose hunting highlighted in black and numbered. The red are road names. When the Association hunter scouts for geese he will have in his possession long before leaving home the Association land maps. They are printed at the hunters home from the Association online library. Using these maps along with binoculars the Association hunter scouts about to find flocks of geese. Feedback over the years from many hunter indicates a range of 1/2 to 2 days scouting has been required through any portion of the season. The key most tell us before scouting is to scout then hunt when the migration reports indicate geese in our Kansas, Missouri, Iowa area. Once finding where the geese are the hunter then using his Association land maps finds a suitable field near where the geese are working. He calls in a reservation to keep that field to himself. Keep min mind it is likely there will be other goose hunters out and about conducting their own unguided goose hunt in a similar manner. A spread is placed, hunters set their own temporary blind and go to calling. That spread may be left in place as long as the hunter maintains his telephone reservation for that numbered field. Part of that telephone reservation is confirmation that field allows ATV, never over the road any type vehicle, access. A caution note. No hunter should even ask to use an ATV on any field planted in winter, meaning green, wheat. ATV use is limited when allowed on the telephone reservation and only on cut crop stubble fields. Common sense, yes it should be. A common schedule would be to leave that spread in place hunting over them morning and/or evening until the geese get smart or for other reason move out of the area. Some goose hunting groups that have the manpower and decoys will make two such setups. Two sets allows working the same over all area in separate fields hunting alternately as geese show they should one or the other spread morning or evening. With waterfowl hunters as a group the most likely to team up for a hunt the Association runs a buddy hunt list. It is a listing of other Association hunters telling name, telephone number, hunting profile that seek to team up with other Association hunters. All on the list are sent a copy of it and each are encouraged to call about the names/numbers of those with similar interest. For those with goose hunting equipment sets teaming up is one means to speed scouting and have more than one spread. Those that do not have goose hunting equipment are cautioned not to expect the other hunter to provide it.